made a woman very happy especially the pricing! delivery was quick and just in time for to match the new outfit! Overstock helps making buying esay! Iconic designer Michael Kors is one of the top names in American fashion, with fashion forward styles and bold designs. This women's watch from the Bradshaw collection features a blue stainless steel bracelet and blue chronograph dial. I love this blue watch by MK I've been eye balling for awhile. Love this watch. It's more of a blue gray then pictured but this works out better. Gorgeous timepiece, this one had a lot of weight to it compared to other watches. Nicely packaged and shipped promptly. The color is quite unusual but so pretty! My only negative comment is that the face is quite dark which makes it difficult to tell time in some light. I absolutely love this watch! It’s nice and heavy, it’s a pretty blue and I’ve gotten a lot of compliments on it! I love it! I love it! I love it! Such a beautiful watch, it is nice and boyfriend big and heavy. Color is so different and amazing, I get compliments about it all the time. You can wear it with everything and I do. So happy I made this purchase, a definite must have. Gorgeous watch...better than I expected. I get compliments on it all of the time. The only feedback is that it's kind of big for a woman's watch....thought I got the wrong one. But that's the style and I love it! Beautiful watch I get compliments from men and women all the time. 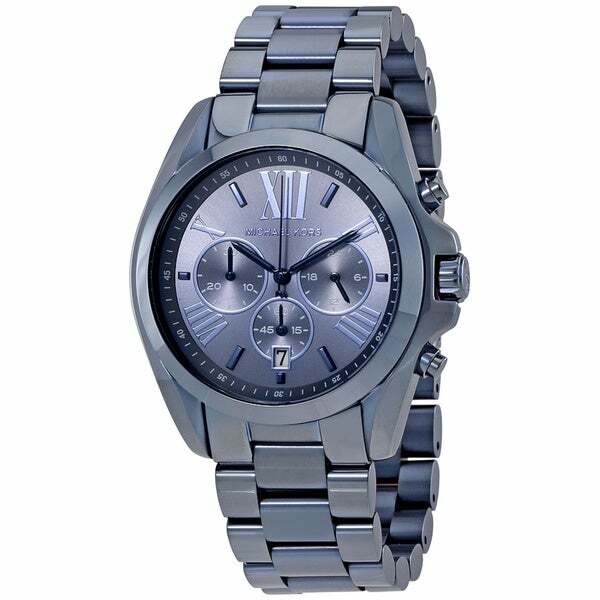 I brought this watch at overstock.com the free shipping is awesome,and I just love it . I wear it every where to work when I hangout with friends, and I get so many compliments about this watch. Very nice! I brought as a Christmas gift for my sister. She loves blue. I think she will really like it. Love this watch, get compliments all the time on it. nice watch, unique style and color, good deal. I didn't know what to expect when I decided to order a watch on overstock, but it came out to be authentic and it is simply beautiful. I will definitely be purchasing another watch soon. Very different looking. Love the color. "Does the watch come in a Michael Kors box?" Yes it will come in the manufacturer's box. Yes it does, nice box.